Wyoming and its neighbors prepare to take over management of the Greater Yellowstone Ecosystem’s grizzly population. Will this include trophy hunts? THEODORE ROOSEVELT MADE the same pilgrimage to wildness that we do. Other U.S. presidents, including Gerald R. Ford—who once was a young Yellowstone National Park ranger—and John Muir, sought it out, too. So did Ansel Adams, modern conservation giants like the late David Brower, Aldo Leopold, E.O. Wilson, the Murie clan, who dwelled at a historic ranch in Moose, and, for direct relevance to this story, the twin brothers John and Frank Craighead. The Craigheads pioneered scientific methods of tracking grizzly bears in Yellowstone during the 1960s, their operation for a time based at their family cabin at Moose inside Grand Teton National Park. Notably, they had to conduct their research up the road in Yellowstone because grizzlies, by then, were pretty much wiped out in Jackson Hole. It was believed the bruins were probably gone for good. For nearly 145 years—since the U.S. Congress and President Ulysses S. Grant signed a law creating Yellowstone National Park—the Greater Yellowstone region has been making American conservation history. As the birthplace of the national park movement and catalyst for the national forest system, this corner of the Northern Rockies has played a role in the way society thinks about the importance of protecting big, natural landscapes—wild ecosystems—and the wonders such as geysers that lie inside them. 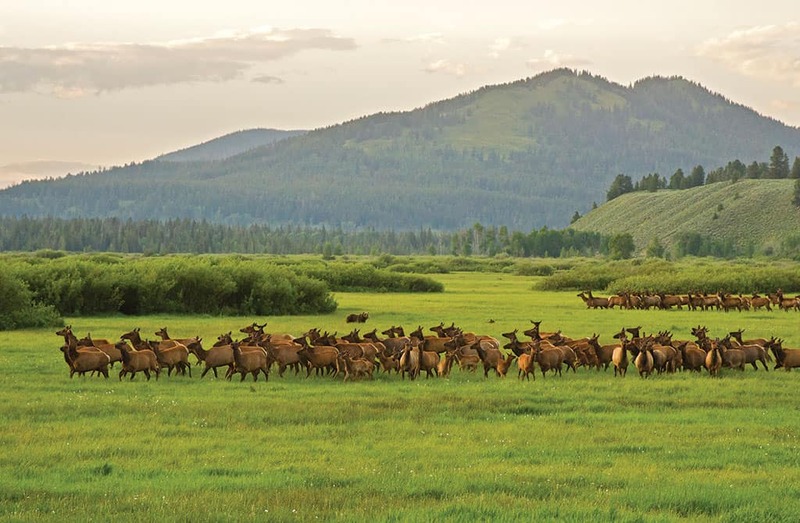 Beyond geysers and other geologic splendors, the Greater Yellowstone region is an enduring global beacon for wildlife preservation. The mosaic of public lands here has been central to rescuing American bison from the brink of total annihilation, also trumpeter swans, pure strains of wild trout, elk, and, perhaps best-known, wolves. It was just last winter that Yellowstone National Park celebrated the twentieth anniversary of wolf reintroduction. Bringing back lobos, eradicated in this area by humans in the 1930s, represents an uncommon kind of biological redemption for mistakes committed by humans against nature in the past. While momentous, the restoration of wolves pales in comparison to an accomplishment never thought possible: the decades-long rescue of Ursus arctos horribilis, a.k.a. the grizzly bear. A predator revered and feared, no animal is more embedded in Yellowstone’s identity, or in our concept of how true wildness feels, than the grizzly bear. This is in part because a single bear might have a home range of hundreds of square miles and needs turf away from people to persist. An entire population of them needs thousands upon thousands of square miles. Also, grizzlies can, and do, kill people—about a half-dozen in the Yellowstone region over the last couple of decades. THIS YEAR, JACKSON Hole has a front-row seat, a better view than any other community in the Greater Yellowstone region, to contemplate the implications of a breathtaking declaration being made by the federal government: forty years after Greater Yellowstone grizzly bears were given emergency federal protection under the Endangered Species Act, when their numbers may have dipped to fewer than two hundred, the U.S. Fish and Wildlife Service (USFWS) is expected to formally issue the population a clean bill of health. Today, wildlife officials say that given their best methods of counting bears—tracking them with radio telemetry, GPS, and aerial surveys—there are at least 750 but probably more than 1,000 grizzlies inhabiting much of the twenty-million-acre Greater Yellowstone Eco-system (GYE). Once they are no longer on the endangered species list, it is up to the states of Wyoming, Montana, and Idaho to manage (via plans approved by the USFWS) the grizzlies within their borders. Taking them off the roster of federal protection, or “delisting,” as it’s called, is a milestone worthy of celebration; it demonstrates that America as a nation refused to let the animal icon of Yellowstone vanish without a fight. But paradoxically, in the eyes of some conservationists, delisting is controversial—a premature action they say warrants profound concern. The present move to delist is actually the second attempt federal and state agencies have made. In 2007, grizzlies were delisted, but that status lasted briefly until 2009, when lawsuits brought by environmental groups challenging protocols for safeguarding grizzlies got the decision reversed. But this time around, armed with undeniable evidence showing growth in bear numbers, an abundance of female bears producing cubs, and grizzlies ranging widely and turning up in far-flung places they haven’t been spotted in more than a century, delisting is, most believe, a fait accompli. Each of these barometers above, established as numeric targets for justifying delisting, have been met for several years running. 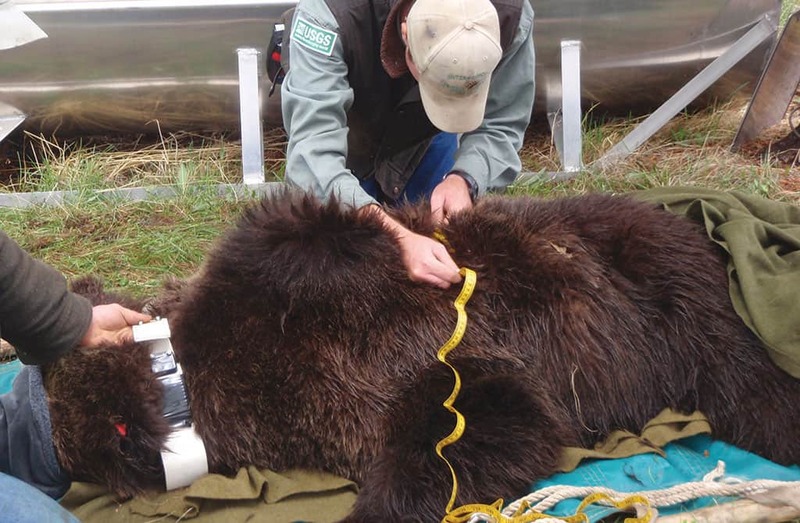 DR. CHRISTOPHER SERVHEEN, the longtime national grizzly bear recovery coordinator for the USFWS based in Missoula, Montana, says the field data is compelling, aligning with public perception of there being a lot more bears than there used to be. But he’ll never forget when, in 1981, colleagues estimated the total Yellowstone grizzly population may have tumbled to two hundred bears or less. “I thought we would be lucky to have any grizzly bears [left] in the Yellowstone ecosystem,” Servheen says. Alarm was accelerated by the fact that bears were dying from deadly encounters with humans at a rate outpacing the number of new cubs being born. “The comeback of grizzlies in Greater Yellowstone has been a truly extraordinary thing to witness. It’s something that could not have happened in 99 percent of the rest of the developed world,” says Steve Cain, who recently retired from his senior wildlife management job in Grand Teton National Park. Twenty-five years ago, Cain only studied black bears; grizzlies were absent from the park. Today, no fewer than sixty populate Jackson Hole and its surrounding mountains, including the Tetons. Grizzlies have been seen on the eastern edge of the town of Jackson and in the Aspens subdivision on the west side of the Snake River. Generally, they’ve shown up there without incident, though bear managers say bears should not be inhabiting human suburbs. SERVHEEN CREDITS THE Endangered Species Act and says it’s a law that works. Because of it, grizzly survival was made a priority, enabling aggressive actions to be taken that otherwise wouldn’t. Sport hunts of grizzlies, over the opposition of rural westerners, were ended in 1974. Natural resource extraction activities that destroyed habitat in national forests, such as logging, mining, and energy development, were rigorously scrutinized. Bear poachers were subjected to huge fines and potential prison time. Some livestock allotments on public lands where cattle and sheep grazed were ended. A major thrust was made to “bear-proof” the way garbage was handled to prevent human foods from habituating hungry bruins. Mark Haroldson, a Bozeman-based, seasoned field man with the Interagency Grizzly Bear Study Team—a wing of the U.S. Geological Survey—has his own footnote in history. Since the late 1970s, when he was a twenty-something, Haroldson has either personally trapped or overseen the radio collaring of more grizzlies than any other researcher. Of the eight hundred bears whose movements have been tracked to better understand their behavior, Haroldson’s tenure overlaps with most of them. On a recent morning, I met with Haroldson and his boss, Frank van Manen, director of the study team, which is the longest-running research unit devoted to the conservation of a large carnivore in the world. The knowledge gleaned from monitoring grizzlies developed in Greater Yellowstone has been exported to the rest of the world in research involving African lions, Siberian snow leopards, and Bengal tigers—three species that are critically imperiled in most of their home ranges and some believe could be extinct in the wild within decades. The study team is a clearinghouse for a fascinating encyclopedia of insights into grizzly behavior, ranging from the hundreds of natural foods they eat, to where and when they go, how long they live, and the things that are most likely to get them killed. High-profile work by the Craigheads served as a catalyst for the study team coming into being. BEARS ARE NOTORIOUSLY slow in reproducing. A female generally gives birth to her first cubs when she reaches the decade mark. The keys to growing a bear population and ensuring it stays healthy are: 1) Keeping as many females of reproductive age alive as possible; 2) Giving bears plenty of unfragmented habitat filled with lots of nutritious, natural foods; 3) Managing people so that they’re smart when navigating bear country; and 4) Educating hunters so their first instinct isn’t to pull the trigger when encountering a bear. Violations of the above are what caused problems in the past, says Christensen of the Greater Yellowstone Coalition. More adult bears in recent years have died in confrontations with elk hunters than any other cause. Some experts predict there’ll be more conflicts with cattle, too. Thompson and members of the bear study team say one reason for more conflict is that bear numbers in the 9,200-square-mile core bear recovery area have reached their biological carrying capacity. That zone encompasses Yellowstone National Park, the northern reaches of Grand Teton National Park, and national forest wilderness areas abutting both parks. As a result, younger bears and mothers with cubs must strike out and establish new territories to inhabit on the fringes of the bear recovery area, resulting in clashes with humans. Since 2003, Wyoming has spent $1.6 million in reimbursing ranchers, mostly cattle operations, for animals killed by bears. Dan Thompson, the large carnivore management specialist for the Wyoming Game and Fish Department, says incidents involving bear predations on livestock have been increasing. But no rancher has been, or is expected to be, run out of business by grizzlies. Still, predation lessens social tolerance. Steve Primm, a biologist and wildlife conflict resolution specialist with carnivores, praises the work of government agencies in protecting habitat and says states have agreed to abide by protocols after bears are delisted, including maintaining an absolute minimum number of bears. The number often kicked around is five hundred, which means a huge percentage of the current bear population—perhaps as much as half, going by the upper estimates—could go away without triggering a relisting of the species. Under Endangered Species Act protection, federal guidelines require that measures be taken to try and keep bears alive by trapping and relocating them. Bears that get into trouble are often given three strikes before they can be “destroyed,” or killed. When Wyoming, Idaho, and Montana take over management, they will have more flexibility. They could manage some “nuisance bears” by subjecting them to trophy hunts. There are people who will pay tens of thousands of dollars for a bear license. That’s worrisome to some environmentalists. As a reference point, today wolves in Wyoming are classified across 85 percent of the state as a “predator.” This allows them to be killed any day of the year and for any reason. It’s this tenor of hostility that’s cause for concern. Van Manen and Haroldson say the growth rate of the population has slowed, but it is still increasing. Independent grizzly expert David Mattson, who formerly was a member of the study team with Haroldson and has recently retired from the U.S. Geological Survey, parent of the study team, says that bear numbers did grow dramatically from the 1990s until recently. However, grizzly population growth, he says, has been based upon an abundance of natural foods, namely four key staples: spawning cutthroat trout in the streams around Yellowstone Lake every spring; the highly nutritious seeds of whitebark pine trees that nourish bears in the autumn prior to hibernation; army cutworm moths that gather in the high-mountain talus slopes, especially in areas northeast of Jackson; and meat that bears get from preying on elk, bison, and moose, and scavenging carcasses produced by wolves or caused by hard winters. But two of those foods—cutthroat trout and whitebark pine—have been devastated by invading organisms, Mattson notes. Greater Yellowstone’s whitebark pine forests have suffered a devastating 80 percent loss from a fungal pathogen called blister rust and simultaneous outbreaks of mountain pine beetle, the latter possibly linked to warming temperatures and climate change. Cutthroat trout as a reliable food source have been virtually eliminated by predatory lake trout illegally put into Yellowstone Lake. Warming temperatures could also affect the life cycle of moths, Mattson says, and it remains uncertain if elk and bison numbers, each of these species facing their own kinds of threats, will remain stable. Mattson believes it’s premature to delist grizzlies. Van Manen at the study team says there is no evidence, yet, to suggest the bear population is on the verge of imminent decline. Haroldson joins van Manen and Servheen in saying that delisting is warranted and also says the looming debate—the elephant in the room—will be waged over trophy hunting. THE VAST MAJORITY of grizzly habitat in the GYE is in Wyoming; that state will be in a position to set the highest take of bears. State officials have grumbled about the costs of managing bear conflicts and the need to turn grizzlies, through dollars generated by the sale of hunting licenses, into net-revenue generators. But both the costs of bear management and the money likely generated through hunting are dwarfed, conservationists say, by the millions upon millions flowing into the GYE’s economy through nature-based tourism, which is anchored by the allure of watching both wolves and grizzlies. A recent study found Yellowstone tourists willing to pay significantly higher entrance fees to see bears; this alone would generate $10 million annually. 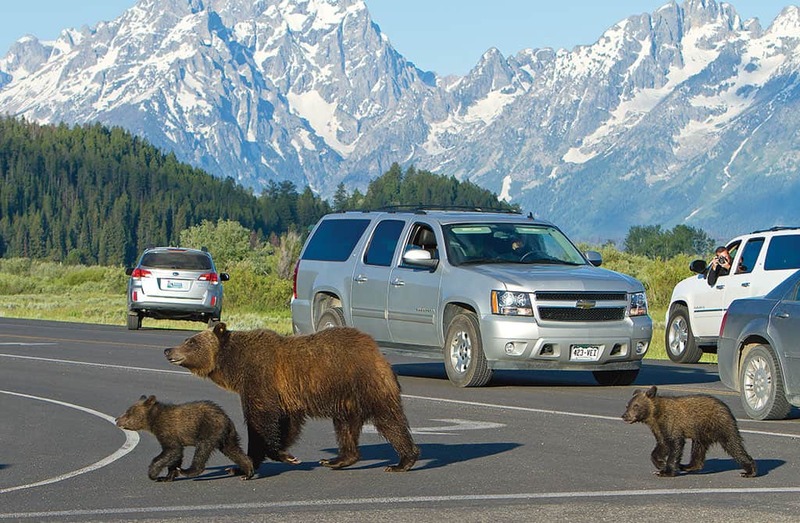 Jackson Hole already knows the economic value of bears. Over the last decade, a family of grizzlies led by a nineteen-year-old matriarch known as research bear No. 399 has become globally famous for being visually accessible along the roadsides of GTNP just east of Jackson Lake. Travelers from all around make special trips to see her and her various broods of cubs. But 399 wanders through a minefield of dangers: gut piles left behind by hunters who, through a special law, are able to kill elk in Grand Teton Park. Big game hunting also occurs on the adjacent Bridger-Teton National Forest, where the bears den and where outfitters and guides would love to offer a sport hunt of grizzlies to their clients. The saga of 399, while inspiring to millions, isn’t always sanguine. 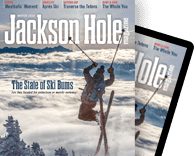 Penny Maldonado, a Jackson Hole conservationist, notes that of thirteen cubs 399 has mothered, a significant percentage of them have died because of run-ins with livestock, hunters, other bears, vehicles, or management actions. “The life-and-death struggles of this bear family is a symbol of the challenges that lie ahead for all grizzlies in Greater Yellowstone, not only after they are delisted but when states push to have bears classified as trophy game animals subjected to hunting,” Mangelsen says. Dan Thompson of Wyoming Game and Fish says his agency understands the value of grizzlies. “In the future, we definitely envision hunting as a management tool, but it will not be the end-all,” he says. “It’s not any kind of silver bullet for bear management. We’re not going to do anything to threaten the population because we’ve done so much to get to this point. 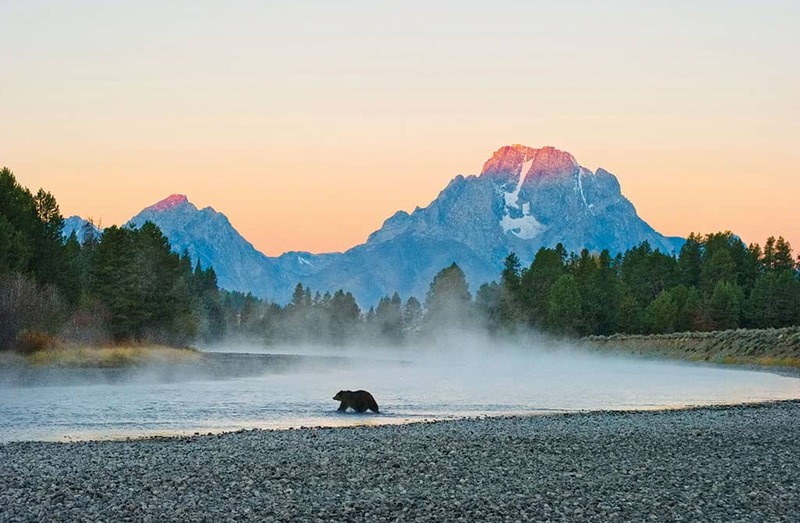 We’re not going to jeopardize that by being greedy in the number of bears that might be harvested in a hunt.” Thompson knows environmentalists, especially conservationists in Jackson Hole, will scrutinize his every move. Servheen, who has spent most of his professional life as a biologist working on reviving Greater Yellowstone’s grizzly population, holds out confident optimism that the bears will do just fine. It’s people who need to learn to get along with each other because that, in the long run, is how a better world is created for grizzlies, he says. Endless division, whether it emanates from a courtroom, a partisan meeting hall, or a rural saloon, is what spoils an accomplishment worth celebrating and sharing by all.